When we think of bees, most of us probably picture lots of buzzing insects flying around together, collecting pollen and making honey. S. Hollis Woodard, a bee researcher and assistant professor in UC Riverside's Entomology Department, says this picture isn't the full one. She says most bees don't live in groups. Most are actually solitary creatures. "We think there are about 20,000 species of bees, and the overwhelming majority of them are solitary. Most of the bees you would probably see showing up in your garden are solitary," she said. Woodard's interest in bees began as a way to learn more about social evolution. She wanted to study bees that live in big social groups. But now she finds herself studying a lot of solitary species, too. That's because her office at UC Riverside is close to the desert. And most bees in the desert live alone. There are only a few groups that live in big social systems, like bumblebees and honeybees. Woodard says there’s a spectrum of how social bees are. Some bees are completely solitary and socialize only when they are mating. 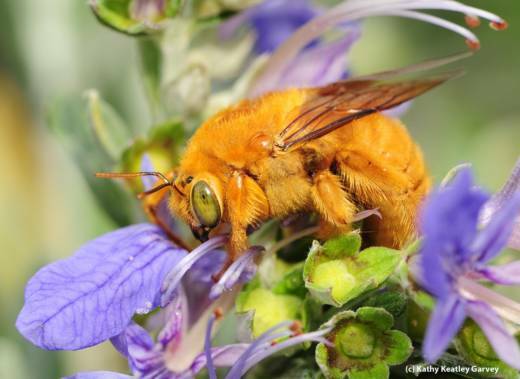 Other bees might live in small little social groups, or socialize occasionally, but she says most bees keep to themselves, like the carpenter bee. We think of bees as pollinator workhorses. But Woodard says not all bees pollinate crops that humans like and use. She says while all bees visit flowering plants and many of them gather pollen, some bees actually gather oil from flowers. Regardless, they all contribute to promoting diversity in the ecosystem at large. While Woodard loves studying bees, her research comes with a cost. Every time she's stung by a honeybee, she has an allergic reaction and must carry an EpiPen with her everywhere she goes. She says this wasn't always the case, though. She used to get stung thousands of times, no problem. "There’s a trend in immunology that if you get exposed to something a lot, and then you don’t get exposed at all, you tend to develop an allergy when you get stung again, when it comes to bee stings," she says. "I got stung [by honeybees] many, many times in graduate school, and then I finished my Ph.D. and then wasn’t around honeybees and didn’t get stung for a while. And then I had one actually fly in a car while I was driving and sting me in the face -- and I had a reaction where I had to go to the hospital," she said. Woodard's favorite bee? The bumblebee, hands-down. Aside from studying how they are social, she says there are many reasons to love the good old bumblebee. Male bumblebees don’t sting, so Woodard says it’s a good trick for a bee biologist to find one and hold him. But unless you know what a male bumblebee looks like, don’t try this at home or in the garden.